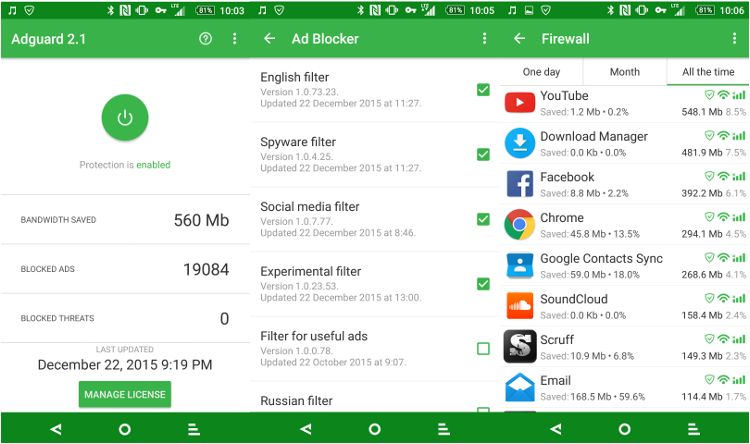 AdAway adblocker adguard ads publicity Do you know how much bandwidth your apps "ADS" using? Do you know how much bandwidth your apps "ADS" using? I've started over a week ago to log the data usage of apps that consumes bandwidth because they are "AD" driven or simply features ads. You'd be surprised that within a week or a little over a week I've nearly accumulated 559 Mb of data usage for 19060 ads that were generated and displayed to me. Anything from playing Candy crush to browsing the web on my mobile device. This bring me to say: "THIS IS CRAZY". The amounts of ads we are subject to for applications and web browsing is just insane. This is by no mean scientific, this is just an observation I wanted to do and we all know that developers rely on many methods to generate revenue. I'm just floored to see the level at which we are projected targeted ads. This brings me to talk about a topic that many people avoid, but that consumers will look up; Ad Blockers. They exist, they are out there and MANY people are actively using them. There's many reason why one would want to use one or not. I'm of the generation that would prefer to not have ads, many of my applications are paid for. Then you have others which won't mind the ads, but in reality you are paying for it one way or another in the form of your bandwidth being used up. I'm also not the average user, I'm a power user, I absolutely do almost everything with my smartphone. This isn't limited to browsing and social media. I do online shopping, I will browse my servers remotely, I will organize spreadsheets and will heavily rely on email, most if not all of the business industry interacts mostly via email. I'd be interested to hear from you guys and see where you fall, what you use and if you've noticed anything different.